Edgar the Peaceable, king of the English, was blessed and crowned with the utmost honour and glory, and anointed in the thirtieth year of his age by the saintly bishops Dunstan and Oswald, and by the other bishops of England, in the city of Bath, in the first indiction, at Pentecost on the 11th of May. Shortly afterwards, he sailed round the north coast of Wales with a large fleet and came to the city of Chester. He was met, as he had commanded, by eight tributary kings, namely Cináed, king of the Scots, Máel Coluim, king of the Cumbrians, Maccus, king of many islands, and five others: Dufnal, Siferth, Hywal, Iago and Iudicael, who swore fealty and bound themselves to military service by land and sea. Attended by them, king Edgar on a certain day went on board a boat, and while they plied the oars, he took the helm, and steered skilfully down the course of the river Dee, and followed by his whole retinue of earls and nobles he sailed from the palace to the monastery of St. John the Baptist. Having paid his devotions there, he returned to the palace with the same pomp. He is reported to have said to his nobles, as he entered the gates, that any successor of his might truly boast of being king of England when he should receive such honours, with so many kings doing him homage. Máel Coluim, here described as ‘king of the Cumbrians’, was a king of Strathclyde. His death in 997 was noted in the Irish annals. The king named ‘Dufnal’ who also attended Edgar’s royal gathering is usually identified as Máel Coluim’s father Dyfnwal, former king of Strathclyde, who died in 975 while on pilgrimage to Rome. Maccus ‘king of many islands’ is probably the Viking warlord Maccus Haraldsson, a significant player in the Irish Sea region at this time. Siferth is unknown but Hywel and Iago (and possibly Iudicael) came from Wales. The idea that Edgar received oaths of allegiance at the meeting might be English propaganda. 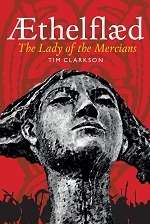 Many modern historians think that the event was more likely to have been a gathering of equals rather than a display of one king’s superiority. Issues of mutual concern were no doubt discussed, with disputes being settled by pledges of peace. 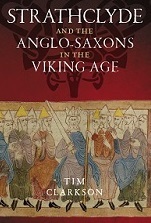 I examine this topic more closely in Chapter Seven of Strathclyde and the Anglo-Saxons in the Viking Age. The illustration at the top of this blogpost was produced by James Doyle in 1864. A depiction of the same event can be seen in a stained glass window at the present-day church of St John the Baptist, which stands beside the River Dee on the site of the Anglo-Saxon monastery. St John the Baptist, Chester: columns of the Norman period. This entry was posted in Kings & queens, Treaties & alliances and tagged Chester, churches, Edgar, Strathclyde, Vikings on August 15, 2014 by Tim. Ideas about Judicael? There are some Breton counts named Judicael about the right age. Yes, it does seem quite likely he came from Brittany. Andrew Breeze made a strong case for this in an article in Northern History: ‘Edgar at Chester in 973: A Breton Link?’ (Vol. 44, No.1. March 2007, pp. 153-157). As you say “the idea that Edgar received oaths of allegiance at the meeting might be English propaganda”. If by The Dark Ages one means the period when Lots of History Happened without anyone writing it down, we need a word for the period when perhaps only one uncheckable account was written down (or only one survived). The “Twilight Ages” won’t do, for fear of confusing it with the Celtic Twilight. How about “The Gloaming”? Won’t do: it should precede the Dark, not follow it. Suggestions? Is there an English word for the murky spell between first light and dawn? Come to think of it, why English? Latin? Irish? Welsh? Norse?